After a long winter, most likely in snowbird destinations like SoCal, the Arizona desert, Central & Southern Florida, and Southern Texas-Workampers are gearing up all across the country to make their way to their summer positions. Places like Yellowstone National Park, Camp Gulf, Adventureland, and a variety of private campgrounds in destinations many tourists can only dream about spending a whole summer, are gearing up to welcome new RV staffers. It’s one of the perks of the Workamping lifestyle- freedom of location! We choose where to go and for how long! Picking up a seasonal gig in that ultra-desirable tourist location and then spending the better part of the travel season getting to really know your surroundings, the community and having a blast exploring locally. What exactly is the Workamping Season? Is it the same as the camping season? Do all Workamper employers hire for the same time frames? 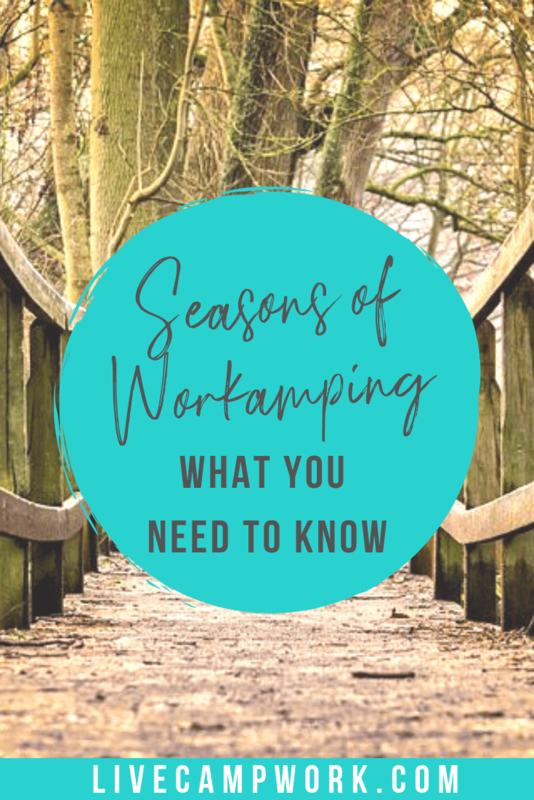 These are the questions that many ask time after time, as there has been some confusion on the definition of the actual Workamper Season… let’s clear that up! The official Workamping Season coincides with the camping season, which starts around Memorial Day and ends right after Labor Day. The exact dates are not defined nor are they important, because not only do employers hire for a variety of start and end dates, they also might ask you to start in the spring or stay through the winter. During the Workamping Season jobs are plentiful. employers are also often overwhelmed with the response to their advertising and the interest to their open positions. Competition is higher overall, but can really be high for places like Alaska, Seattle, Maine, and National Parks. Start applying early in the fall/winter and you will be successful in getting a head start on the masses. Line up your summer gigs before spring starts to make sure you get your perfect position. The Workamping Season is essentially the easiest time to find work. The winter, on the other hand, is more of a challenge, so let’s spend most of our time in this chapter discussing those details. Family dinners, holiday parties, and for a lot of Workampers, the end of the Camperforce season all mark the start of the next leg of the Workamping adventure…the Winter Season. Workamping during the winter really isn’t unusual. It will require a little more planning and forethought than the typical route of securing a job for the Workamping Season! The Winter Season brings a bucket load of questions, tons of uncertainty, and even some restlessness as the Workamper chooses to settle into monthly stays at snowbird-friendly parks in the south and far west, still wondering if they could have found a job for the winter instead. The idea that Workamping during the winter is minimal – and to some extent none existent – is one to be taken lightly. It’s pretty far from the truth if you’re willing to step outside your comfort zones, plan ahead, and maybe use some creativity to find a position you feel good about.